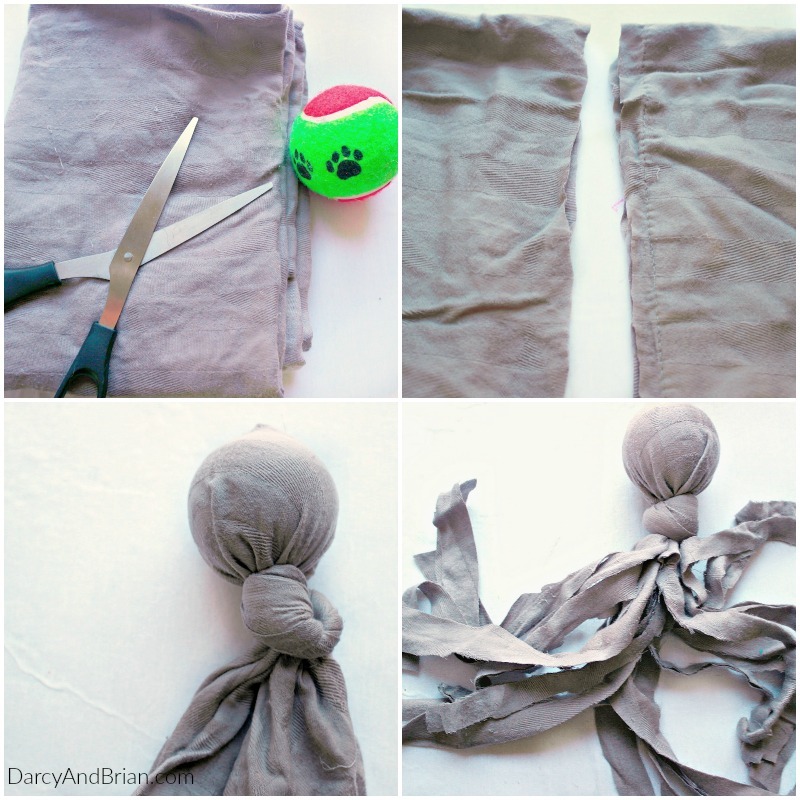 Make your own homemade dog toy from a few simple items you may already have at home. When you have a puppy who loves to play and chew on everything in the house, you can end up spending a lot of money on new dog toys. 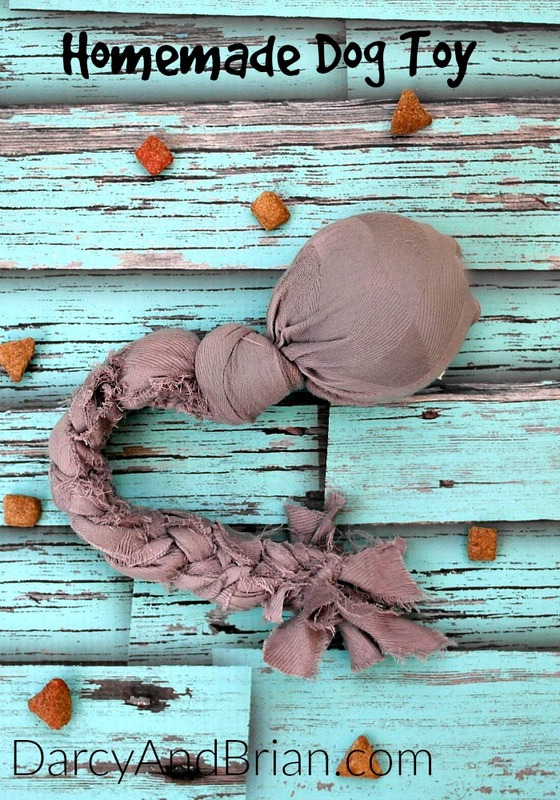 This is why we love this easy DIY dog toy tutorial. 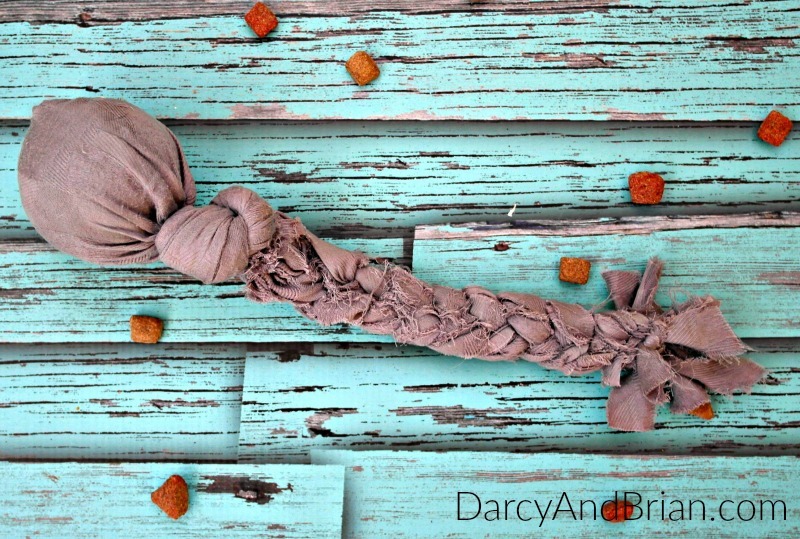 This is probably the easiest tutorial for making a dog toy at home! There is no sewing involved and it takes about 10 minutes to make. We adopted our puppy, Vivian, last fall. She's a ball of energy and loves to play nonstop. Fetch and tug-of-war are her favorites, though she thoroughly enjoys running laps around the living room with the kids. It's amusing to watch because she squeaks a toy in her mouth the entire time and will bump the back of the kids with the top of her head, like she's herding them or something. I know one of the keys to keeping her from teething and chewing my couch is to provide her with lots of things she is allowed to chew on. This is one reason why I bought her a six month subscription to BarkBox. 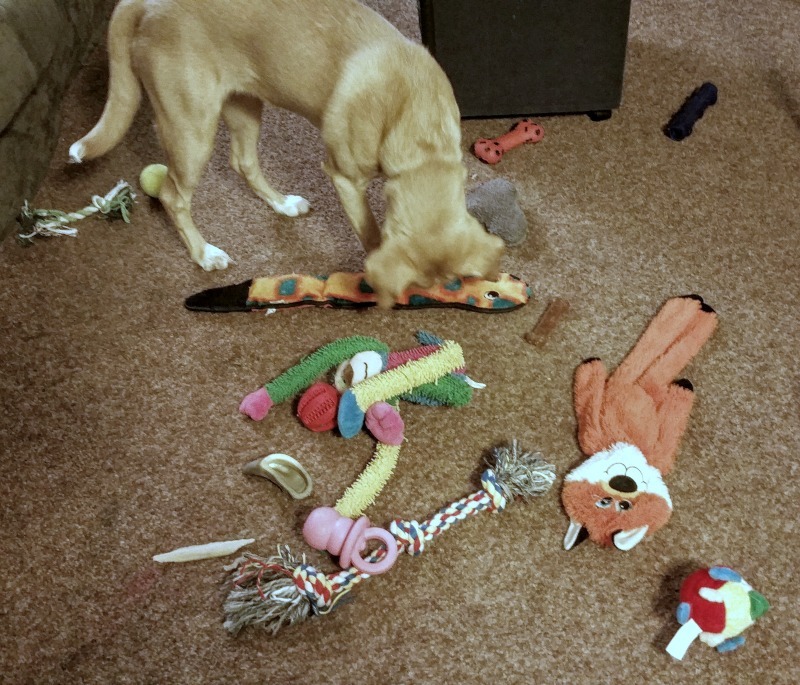 Even if she doesn't stay interested in all of the toys, it's been a great way to continue introducing new dog treats and toys to her. She gets excited when her monthly BarkBox arrives now! A few of the toys have joined her rotation of favorites. Start by cutting the off the open edge of the pillow case (the side where you insert the pillow). Discard or save that piece for another project. Place the tennis ball into one of the corners and grab onto the fabric tightly underneath the ball. Twist the fabric tightly. Keep twisting until the fabric is gathered enough that you can tie a knot. Cinch the knot as tight under the ball as you can. Start cutting the pillow case in strips up to the knot. You only need about 12 strips. Go ahead and cut off the extra fabric. Once you have all the strips cut, separate them into equal groups of 3. Braid the sets together (like you would if you were braiding someone's hair). When you get to the end tie another tight knot. Trim where needed and toss it to your doggy! Congratulations, you made your own dog toy! So, buying new balls, rope bones, and squeaky toys is something we do frequently, but DIY dog toys are a great way to stretch your pet budget. It's also a great way to upcycle things like old pillow cases. Always supervise your pet when playing with toys and remove them if they start coming apart. Your mileage will vary depending on how heavy of a chewer your pup is. A few of Vivian's favorite dog toys are Kongs. We like to fill them with tasty treats or kibble mixed with peanut butter. It provides mental stimulation as she eats her meal. Kongs withstand a lot of chewing too! She loves a squeaky porcupine toy we got from Meijer. It was the first toy we bought when she came home with us. Besides the noise, I think she likes the texture of biting on it. Vivian also went crazy over this flat, stuffingless rabbit dog toy. It doesn't have stuffing, but does have a squeaker. She still plays with it from time to time and I love not worrying about her pulling stuffing out of it. Great idea! Thanks for sharing your crafty dog toy tutorial on this week’s #MondayFundayParty!